Home Uncategories Sarah Geronimo outshined Anne Curtis at Annebisyosa Concert? Sarah Geronimo outshined Anne Curtis at Annebisyosa Concert? 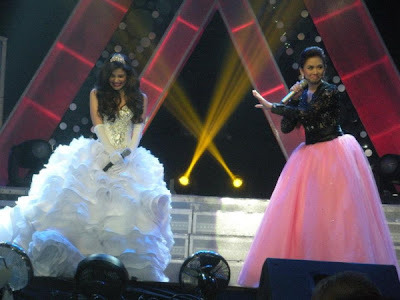 The Annebisyosa Concert held Jan. 28 had Anne Curtis in one concert stage with Sarah Geronimo. The PopStar Princess Sarah Geronimo and Princess of All Media Anne Curtis share one stage to perform "I Don't Wanna Miss A Thing". It's cute how Anne introduced Sarah Geronimo as the real Concert Princess, and Sarah definitely had her own moment in Anne's concert. Sarah Geronimo also performed "End of Time", which was beyond great and highly-applauded. For sure, the crowd for a while forgot that they're watching Anne's concert and not Sarah's. Even real estate heiress and fashion model Divine Lee was in great awe watching Sarah's performance. Divine, who's a close friend of Anne, said on Twitter last night that it was her first time to hear Sarah singing live. Her tweets would tell that she was so impressed with the PopStar Princess. "Eto na! @annecurtissmith with Sarah Geronimo! Grabe ang ganda ng boses... Ni sarah! Haha! Love u Anne! Ikaw din. :)"
"Nakakaloka... First time to hear Sarah Geronimo. Iba siya. May sanib. Galeng!" "Ok Sarah G fan na ako. Promise." "Sino President ng Sarah Geronimo fans club? Pwede ako pumalit? Graabbbbbeeeee!" So, did Sarah Geronimo own Anne's concert? Maybe, unintentionally, it happened for a moment, but in their 'biritan', Sarah somehow made everyone feel that it's Anne's concert, not hers, and she also let Anne shine in their number together.